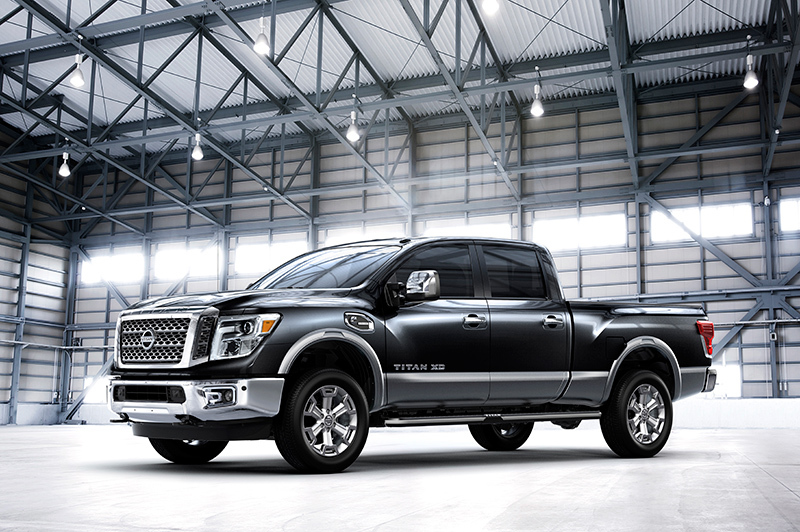 The new 2016 Nissan TITAN is designed to be a warrior for “warriors” – both in look and in performance. That’s according to the team at Nissan Design America (NDA) in San Diego, Calif. that played a major role in its creation. Nissan Design America explored the ancient roots of the name ‘TITAN’ in creating this vehicle, and both the front end and logo were inspired by the warrior helmets of antiquity. The stance of TITAN is also very warrior-like, with influence from the latest technological advancements, as well as its very powerful engine. The engine, of course, is not just any engine. It’s the new TITAN XD’s available Cummins 5.0L V8 Turbo Diesel, producing 310 horsepower and 555 lb-ft of torque. Powerful gasoline V8 and V6 engines will also be available in the TITAN lineup. For the TITAN XD model, the design team formed the sheet metal around the volume of the engine bay – creating a design with a scale and honesty to honor the Cummins power and real work heritage. With the available Cummins diesel engine and rugged fully-boxed ladder frame as its foundation, the designers knew that the new TITAN would have to be more grown up, more serious and more imposing in scale than the first-generation Nissan Titan. The front end of the new TITAN sets the tone for the entire design as a powerful, precision tool with its imposing stance, large dramatic light treatment, and on TITAN XD, a combination of TITAN and Cummins badging. The lights, grille, hood, fenders and bumper are intended to project a somewhat technical feel, like the pieces of an interlocking puzzle or even a hint of armor. 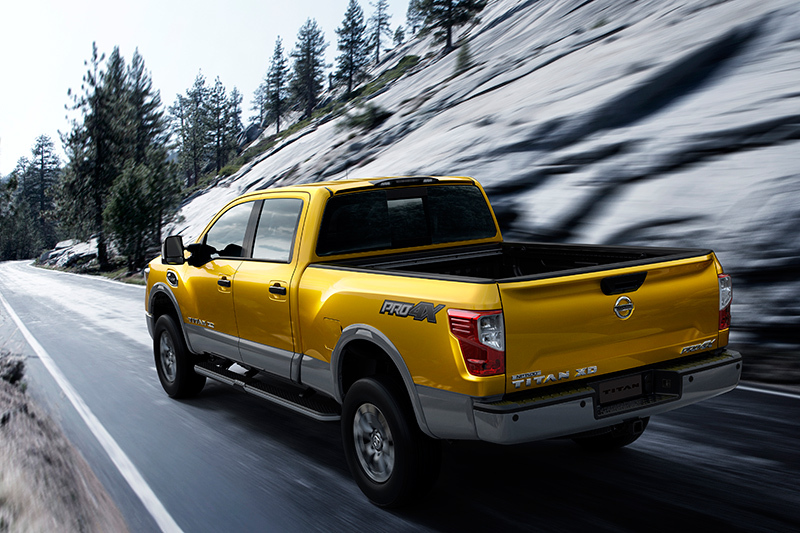 Rather than emulating any of the full-size pickups on the market today, including the current Titan, the designers wanted to new TITAN to reflect Nissan’s design language – but on a much larger scale than done before. The resulting design is more anatomical, rather than architectural. The front looks like a mask and the sides are shaped, not slabs, with the whole presence anchored by an emphasis on the very large and mechanical-looking wheels, which were inspired by big box-end wrenches. While the TITAN XD, with its available Cummins diesel under the high, bold hood, is the first of a range of new TITANs to be shown, the same work-truck qualities will carry through to the rest of the future TITAN lineup, which will include Crew Cab, King Cab and standard cab configurations, two frame sizes and several bed lengths. Special attention in the design process was also paid to projecting a visual sense of the new TITAN’s high quality and attention to detail. For example, where the current generation TITAN uses a three-piece front bumper, the new TITAN uses an integrated single-piece design. The bumper is flush with the fascia, the wiper arms and windshield washer nozzles are hidden from sight. Even the rear license plate lamps are inset into the bumper. Like the original, the new TITAN is also designed to move the full-size truck segment forward in terms of pickup bed utility. TITAN is building on its history of innovative bed storage with the spray-on bedliner and cargo tie-down systems, by adding features such as LED bed rail lighting and a more flexible storage box design. The original Titan’s bedside storage compartment was rethought, with consideration of how real truck users need more space and flexibility. So the storage boxes were moved into the bed and made more practical for use with camper shells or tonneau covers. The design is waterproof, drainable, lockable, removable when needed, and less obvious to outside eyes – all things owners will really appreciate. Other key exterior design elements include improved aerodynamics (versus the previous-generation Titan) through use of items such as rear tire wind deflectors, bed seals (between the cab and bed) and integrated spoilers for the front, roof and tailgate. 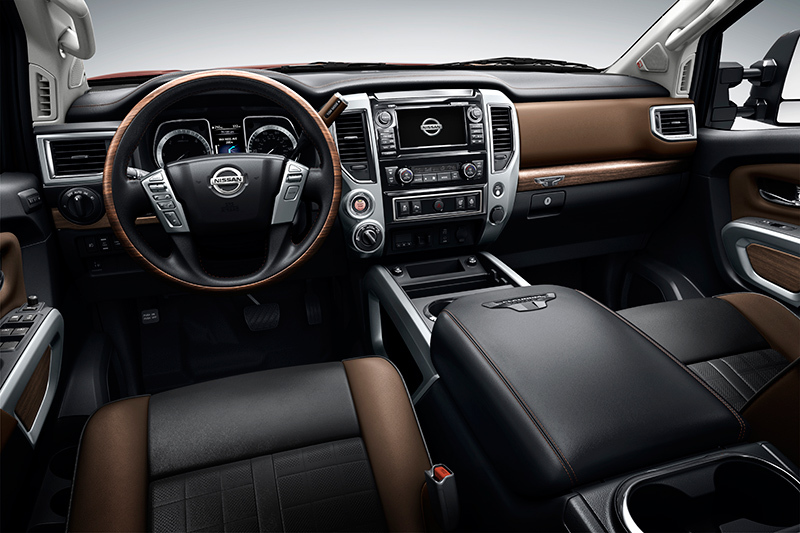 The design of the new Nissan TITAN’s interior both mirrors the exterior’s bold, powerful work truck image and departs from it, with a masculine yet premium quality. The combination of durability and comfort is found throughout the spacious interior, along with a marriage of quality materials and attention to detail. While the amenities and features are targeted at work customers, there is also a sense of sportsman style, such as the available black-and-tan quilted leather appointments that were inspired by the quilting inside of a premium hunting jacket. The wide range of available interior features includes a new ergonomic 4-spoke, steering wheel design, front and rear NASA-inspired Zero Gravity seats, chrome finishers and premium stitched trim and work-scaled knobs with ergonomic grips. The large center console is designed to serve as a mobile workstation, and the previous-generation Titan’s gated center shift lever has been moved to the column to free up additional storage space. The wide instrument panel offers a high-tech look and feel with the use of both analog and digital displays. The TITAN’s LCD message center display includes a comprehensive list of available text messages to help monitor critical engine temperature and pressure levels while hauling and towing. Thoughtful utility features are also found throughout the TITAN cabin, including a lockable storage compartment under the rear seat for securing small items, even when the truck doors are unlocked. There’s also a convenient fold-out rear floor panel, available when the rear seat is folded up, for carrying and securing large items. Using the innovative first-generation Titan as the starting point, the design team really thought through all of the little things that make living with a truck every day more enjoyable. For example, the bottle holders in the doors can hold 20-once cups, the console can hold 32-ounce sports drink bottles and the overhead sunglasses bin now holds a much wider range of sports-styled sunglasses. The design team’s goal from the start was to create an authentic full-size truck with a bold and commanding presence. They also wanted to honor Nissan’s long truck heritage, which goes back to the very beginnings of the company, while moving forward into today’s technology-driven era. For more information about Nissan’s history in the truck market and design and testing of the new TITAN, please check out the Nissan TITAN “Truckumentary” here: www.nissannews.com/TITAN. Content and images provided by: Nissan North America, Inc.